Once upon a time, when my veil was strong, I thought I was separate from my higher self and the higher consciousness. Disconnected from spirit awareness, I relied on my primal instincts to survive. When it served me to fight, I fought. When it served me to hide, I took flight and hid. As the years went by, I developed patterns of behavior relating to my instinctive fight-or-flight responses. I became comfortable with the familiar energies of aggression. I became comfortable with the familiar energies of victim and isolate. As the survival game of aggressor and victim played out, I learned how painful it was to be open, to sense, and to feel. I also learned different ways to escape from my uncomfortable feelings and senses. I had many unique addictions to numb my pain. I had many unique ways to deny and distort reality to make my life easier. I created rules to follow and roles to play. I created fantasies, illusions, and projections to live in to escape reality. I learned to act and function within these conceptual dynamics to survive. I learned offensive and defensive skill. I learned to control and manipulate. I did whatever I needed to do in order to survive. Over time, as life evolved, I began to tire of the survival process. I became exhausted acting out my survival roles and playing my survival games. I began to open to a new way. As I unmasked, I reconnected with my true feelings and senses. I faced the truth of what was. I started to look inward and acknowledge the beauty, magic, and wonder of my true authentic self. I looked inward and embraced my true divine wisdom, love, and light. As I went through this awakening and transformation, I began to notice that there were other people around me doing the same thing. There were waves of people acknowledging their masks. There were waves of people looking beyond their conceptual rules and roles. There were waves of people owning their true authentic selves. There were waves of people opening their hearts and embracing their true divine wisdom, love, and light. In the larger picture, the mass consciousness was being impacted by the waves of people that were seeing beyond the conceptual rules, roles, patterns, and programs. The mass consciousness was being impacted by the waves of individuals who were coming together to honor and respect the uniqueness of each individual. This new way of seeing beyond the social, tribal, and group conceptual reality to the unique feeling, sensing, and knowing of each individual was now transforming the rules, roles, patterns, and programs of the social, tribal, and group dynamics. A new way of being was truly unfolding that was beginning to transform the rules, roles, patterns, and programs of the mass consciousness. Today, this new way of being is continuing to take shape. This new way of being is simple, at first. You start off by being present and honest with yourself in each moment. It is all about owning the conceptual rules, roles, patterns, and programs that you live by and then differentiating yourself from those learned ways. You step beyond those ways and discover your real authentic self. You step beyond your judgments, assumptions, and expectations and discover your unique feelings, sensations, and knowing in each moment. Eventually your awareness becomes more complex. As you are present and honest with yourself, you begin to open to the different dimensions of yourself. You begin to open to your unique sensations of physical, emotional, mental, and spiritual reality. As you open multidimensionally, you experience a new kind of awareness and dance between your body, emotions, mind, and spirit and you become fully awakened to the realization that you are whole. As you honor and respect your individual uniqueness on all levels: body, emotion, mind, and spirit, you become individuated. As you honor and respect the uniqueness of all aspects of yourself, together as one, you become aware of yourself as a magical whole beyond your sum. This is the birth of your individuated whole self. With this birth comes the birth of your reverence for the sanctity of all individuated beings within the oneness of all that is. As you honor each aspect of yourself, you honor each aspect of the other. As you honor each aspect of self and other, you honor all life. As you honor all life, you begin to honor, respect, and care about all living things within the oneness of all that is. You begin to honor, respect, and care about animals, plants, trees, forests, lakes, rivers, oceans, atmospheres, planets, solar systems, universes, and more in totally new ways. You begin to honor, respect, and care about all of life in deeper and more personal ways because you are beginning to accept your own uniqueness within the oneness. You are unique and you are a part of all that is. You are individuated oneness and so is everything else. Is This A Time Of Awakening For You? Today, many people still live within the outdated rules, roles, patterns, and programs of the past. Many people still mask what is uncomfortable. Many people still act out of fear and struggle to gain power and control over their reality. Is this your time to come more fully into what you sense, feel, and know in your present moment? Are you ready to come more fully into your physical, emotional, mental, and spiritual awareness of what truly is? As you courageously look beneath each mask, release each judgment, and step beyond each conceptual creation, you see what is real and you are rewarded with the beauty and wholeness of your true self. 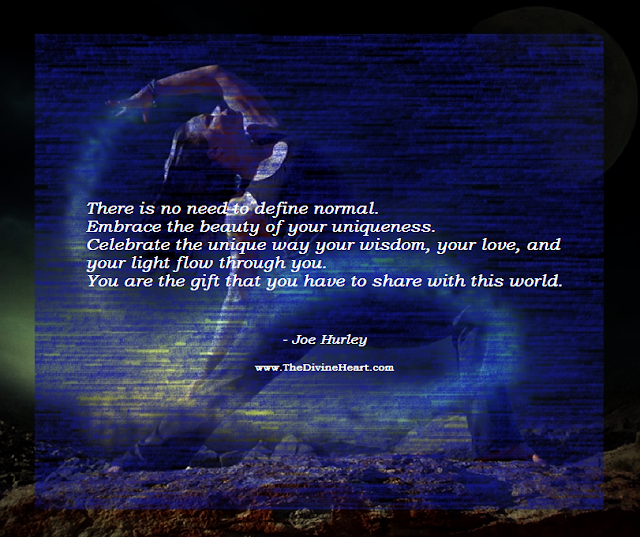 As you awaken, you are gifted to sense and know the true love and wisdom that exists on all levels, within your true self and within all life. Do you feel the calling to embrace your next level of awakening to the real authentic you and the true authentic reality of what really is? For more information about individuated oneness, awakening, and to discover your unique part in our new unfolding divine reality, please read through all my writings and teachings.